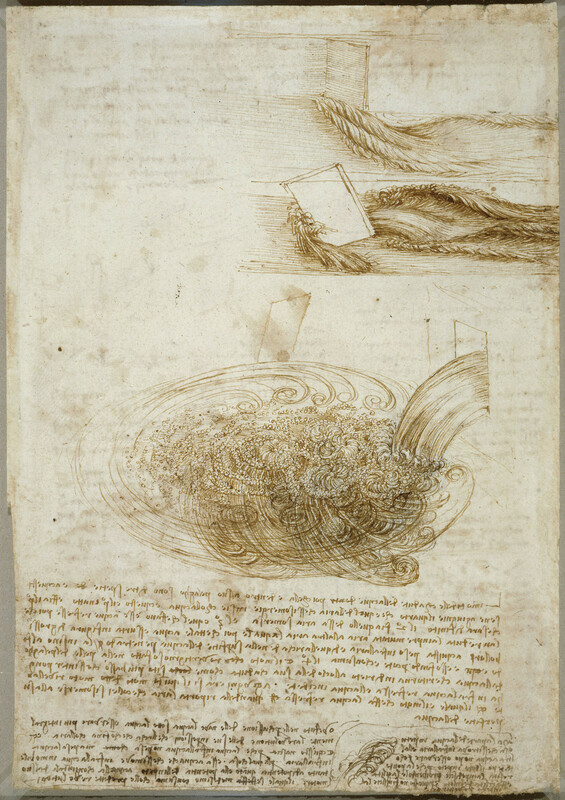 Water obsessed Leonardo throughout his life. His earliest dated drawing, of 1473, is a landscape showing a river cascading over rocks and streaming away down a valley; his final sheets, forty-five years later, are haunted by visions of deluges destroying the Earth. He surveyed the Arno for the Florentine government and planned a canal to render Florence navigable from the sea; and in the years around 1508-11 he studied hydraulics in great detail with the unrealised intention of compiling a treatise on the subject. 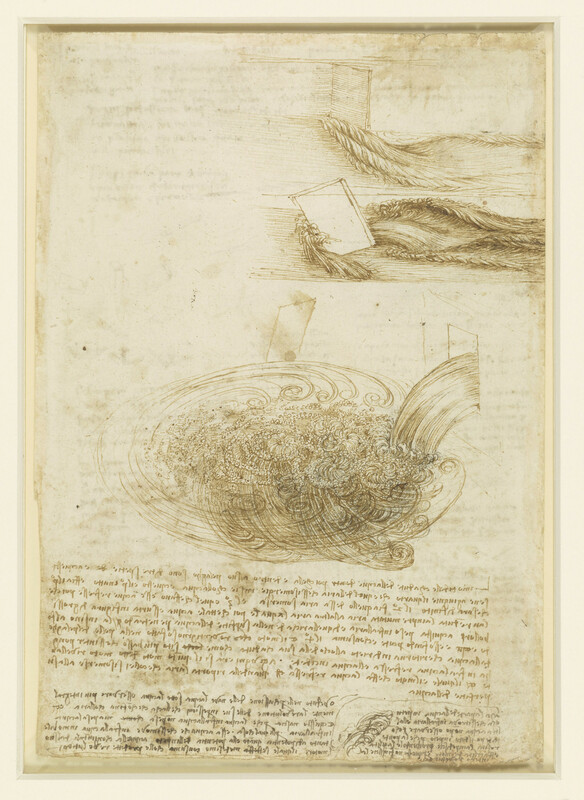 Leonardo made hundreds of observations on the movement of water at this time, and although certain themes recur - in particular his astute analyses of complex motions in terms of linear and circular components - the superabundance of particular cases prevented him from ever realising a set of generally applicable laws. 'The movements of water as it falls into its pool are of three kinds, and to these a fourth is added, which is that of the air submerging itself with the water. And this is the first in action, and let it be the first to be defined; and let the second be that of the said submerged air, and the third that made by reflected water as it restores the air compressed in it to the other air, such water being raised in the shape of large bubbles to acquire weight in the air, whence it falls back through the water surface all the way to the bottom, which it strikes and consumes. The fourth is the eddying movement made on the pool surface by the water that comes back to the place of its fall, this being the lowest place between the reflected and the impinging water. The fifth motion will be added, and this is called the welling motion, which is the movement produced by the reflected water when it brings the air that was submerged with it back to the water surface. I have seen in the percussion of the water against the ship's prow that the water below the surface maintains the circumvoluted motion caused by its impact much longer than the water in contact with the air. And this occurs because water within water has no weight, but it has weight within air. Hence such water as moves through motionless water has so much power as the impetus given to it by its mover, which uses itself up through the said circumvolutions.